most patients develop acquired resistance to gefitinib within a few years. Recently, many studies have been performed to determine precisely how to select patients who will respond to gefitinib, the best timing for its administration, and how to avoid the development of acquired resistance as well as adverse drug effects. Lung cancers are classified according to their his­tological type. Because each variant has different bio­logical and clinical properties, including response to treatment, a precise classification is essential to pro­vide appropriate therapy for individual patients. Lung cancer consists of two broad categories—non-small cell lung cancer (NSCLC) and small cell lung cancer (SCLC). is transforming the diagnosis and treatment of non–small-cell lung cancer (NSCLC). The convergence of advancing research in drug development and genetic sequencing has permitted the development of therapies specifically targeted to certain biomarkers, which may offer a differential clinical benefit. 1. National Comprehensive Cancer Network (NCCN). NCCN Clinical Practice Guidelines in Oncology™: Non-Small Cell Lung Cancer. Version 2.2012. 2. Gazdar AF. Epidermal growth factor receptor inhibition in lung cancer: the evolving role of individualized therapy. Cancer Metastasis Rev. 2010;29(1):37-48. Lovly CM, Carbone DP. Lung cancer in 2010: one size does not fit all. Nat Rev Clin Oncol. 2011;8(2):68-70. 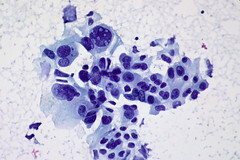 Dacic S. Molecular diagnostics of lung carcinomas. Arch Pathol Lab Med. 2011;135(5):622-629. Herbst RS, Heymach JV, Lippman SM. Lung cancer. N Engl J Med. 2008;359(13):1367-1380. Rosell R, Gervais R, Vergnenegre A, et al. Erlotinib versus chemotherapy (CT) in advanced non-small cell lung cancer (NSCLC) patients (p) with epidermal growth factor receptor (EGFR) mutations: interim results of the European Erlotinib Versus Chemotherapy (EURTAC) phase III randomized trial. Presented at: 2011 American Society of Clinical Oncology (ASCO) Annual Meeting, J Clin Oncol. 2011;29(suppl). Abstract 7503. Aug 6, 2012. http://www.asco.org/ASCOv2/Meetings/Abstracts?&vmview=abst_detail_view&confID=102&abstractID=78285. Kwak EL, Bang YJ, Camidge DR, et al. Anaplastic lymphoma kinase inhibition in non–small-cell lung cancer. N Engl J Med. 2010;363(18):1693-1703. National Comprehensive Cancer Network (NCCN). NCCN Clinical Practice Guidelines in Oncology™: Non-Small Cell Lung Cancer. Version 2.2012. College of American Pathologists (CAP)/International Association for the Study of Lung Cancer (IASLC)/Association for Molecular Pathology (AMP) expert panel. Lung cancer biomarkers guideline draft recommendations. http://capstaging.cap.org/apps/docs/membership/transformation/new/lung_public_comment_supporting_materials.pdf. Aug 6, 2012. Gazdar AF. Epidermal growth factor receptor inhibition in lung cancer: the evolving role of individualized therapy. Cancer Metastasis Rev. 2010;29(1):37-48. 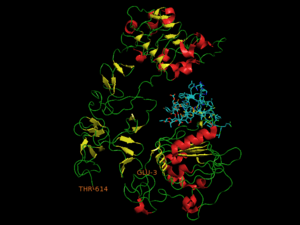 In 2002, gefitinib (ZD1839; AstraZeneca) , the first epidermal growth factor receptor (EGFR) tyrosine kinase inhibitor, became available as an innovative molecular-targeted drug for the treatment of unresectable NSCLC. Initially, many NSCLC patients were expected to respond to gefitinib because many solid tumors, including NSCLC, are known to overexpress EGFR, which has a role in tumor pro­liferation and is used as a biomarker to predict poor prognosis. Gefitinib was shown to have a dra­matic effect on a limited number of patients; but it was ineffective in 70%–80% of patients with NSCLC. There have been reports of death caused by interstitial pneumonia (IP), one of the critical adverse drug reactions (ADRs) associated with gefitinib use. Therefore, there is a need for predicting the effects of gefitinib, and criteria for select­ing patients who could be treated with gefitinib. to select patients who will respond to gefitinib in the clinical setting. treatment using a lower concentration of erlotinib. (2) while EGFR overexpression is known to be more common in SCC than AC, gefitinib shows a higher antineoplastic effect on AC than on SCC, while other reports indicated no correlation between the expression levels of EGFR and clinical outcomes. In 2004, somatic mutations were identified in the EGFR tyrosine kinase domain of patients with gefitinib-responsive lung cancer, as compared with no mutations in patients exhibiting no response, and the presence of an EGFR mutation was highly correlated with a good response to gefitinib.The conformational change of the EGFR ATP-binding site caused by genetic mutations constitutively acti­vates the EGFR downstream signaling pathway and increases the malignancy of cancer. Conversely, the conformational change of the ATP-binding site can also increase its affinity for gefitinib; therefore, gefi­tinib can inhibit the downstream signaling pathway more easily, strongly induces apoptosis, and reduces the proliferation of cancer cells. deletions in exon 19 and missense mutations in exon 21 account for ∼90% of these mutations. The detection of EGFR muta­tions in exons 19 and 21 is considered to be essential to predict the clinical efficacy of gefitinib. the affinity of gefitinib to ATP is unchanged. The detection of EGFR and KRAS mutations has been usually achieved by sequencing DNA amplified from tumor tissues; however, sequencing techniques are too complex, time-consuming, and expensive. The selection of an appropri­ate method to detect EGFR and KRAS mutations is essential to make an exact prediction of the efficacy of gefitinib in individual patients. Advances in diagnostics and treatments for NSCLC have led to better outcomes and higher standards of what outcomes are expected. These new understandings and treatments have raised multiple new questions and issues with regard to the decisions on the appropriate treatment of NSCLC patients. Biomarkers are increasingly recognized and applied for guidance in diagnosis, prognosis and treatment decisions and evaluation. PF Engstrom, MG Bloom,GD Demetri, PG Febbo, et al. evaluation of therapy of patients with cancer. Therefore, the discussion focused on molecular tests that predict outcomes for therapy. Lung cancer in the never smoker population is a distinct disease entity with specific molecular changes, offering the potential for targeted therapy. intended to improve the standard chemotherapy regimens for NSCLC. Along with the advent of targeted therapy, identifying biomarkers to predict the subset of patients more likely to benefit from a specific targeted intervention has become increasingly important. they account for approximately 85% of EGFR mutations in NSCLC. Other EGFR mutations have been detected, particularly in exon 20. What is the role and application of molecular profiling in the management of NSCLC? Non-small cell lung cancer (NSCLC),the most common type of lung cancer, usually grows and spreads more slowly than small cell lung cancer. Smoking causes most cases of lung cancer. The risk depends on the number of cigarettes you smoke every day and for how long you have smoked. Some people who do not smoke and have never smoked develop lung cancer. approximately 85% of all lung cancers. Lung cancer may produce no symptoms until the disease is well advanced, so early recognition of symptoms may be beneficial to outcome. 55% of patients have distant spread of disease. Historically, our second-line therapy has evolved into a strategy of pursuing single-agent therapies for patients with advanced non-small cell lung cancer (NSCLC) who have received prior chemotherapy. This approach was developed on the basis of benefits conferred by such established treatments as docetaxel, pemetrexed, and erlotinib — each well-tested as single agents — and evidence indicating a survival benefit in previously treated patients. it provides more evidence that our current approach of sequential singlet therapy remains appropriate. only patients with non-squamous NSCLC because of mounting evidence that pemetrexed is not active in patients with the squamous subtype of advanced NSCLC. Patients must have received prior chemotherapy (without restriction on regimen except that it could not include pemetrexed). Participants were randomly assigned 1:1 to receive pemetrexed at the standard dose of 500 mg/m2 IV every 21 days or the same chemotherapy with carboplatin at an area under the curve of 5, also IV every 21 days. The primary endpoint for the trial was progression-free survival (PFS), and the trial was intended to have results pooled with a nearly identically designed trial that was done in The Netherlands. The Dutch trial compared pemetrexed with carboplatin/pemetrexed at the same dose and schedule. The vast majority of patients (97.5%) had a performance status of 0 or 1, and the median age was 64 years. median PFS was 3.6 months with pemetrexed alone vs 3.5 months with carboplatin/pemetrexed. RR 12.6% vs 12.5%, median OS 9.2 vs 8.8 months, for pemetrexed and carboplatin/pemetrexed. the patients with squamous NSCLC had a superior median PFS of 3.2 months with the carboplatin doublet vs 2.0 months with pemetrexed alone. Unfortunately, this only confirms that adding a second agent is beneficial for patients receiving an agent previously shown to be ineffective in that population. Putting it in the context of previous data, these results only provide further confirmation that more is not better. this is likely to be especially relevant in previously treated patients whose ability to tolerate ongoing therapy over time may be reduced. It is critical to balance efficacy with tolerability to enable us to deliver the treatment over a prolonged period. We need to recognize the importance of pacing ourselves if our goal is to administer treatments in a palliative setting for an increasingly longer duration. E Topol, B Buehler, GS Ginsburg. Gazdar AF. 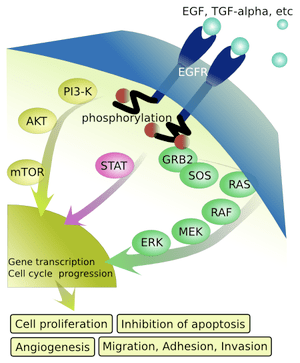 Epidermal growth factor receptor inhibition in lung cancer: the evolving role of individualized therapy.